Hunters know that field dressing or skinning a game animal after dark is no easy task. If you’re alone without a hunting buddy to hold the light for you, or without a headlamp it can be nearly impossible. Thanks to Real Avid and their lighted knife technology, this tough task just got a whole lot easier. Real Avid made history with its Revelation LED-lighted knife, making it safer and easier for hunters to field dress game after dark. 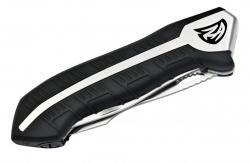 Now, they are introducing the Revelation AMP 3-in-1 Field Dressing Knife and the Revelation AMP Folding Knife.